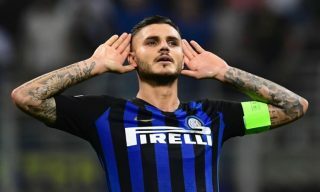 Mauro Icardi is almost certain to leave Inter Milan this summer after conflict between management saw him stripped of captaincy and side-lined for games. And Manchester United are preparing a move for the Argentine striker, if La Gazzetta dello Sport’s report is to be believed. The 26-year-old is currently in dispute with his club over negative comments made by his wife and agent Wana Nara. Icardi decided to support his wife rather than distance himself from her comments, often shared on her Instagram account, and that should see his future elsewhere. There will be no shortage in interest for Icardi’s signature. He has proved in three different Serie A campaigns he’s a 20+ goal per season striker and Ole Gunnar Solskjaer would hardly take much convincing to take up an opportunity to work with this player. Icardi is also linked with summer moves to Real Madrid and Juventus, but it sounds like United have joined the race for his signature. If Inter want rid of Icardi, which is likely after such conflict, negotiations may become a step easier. The Daily Mail reports that Inter will listen to offers of £68 million for Icardi this summer. That’s not bad value for a goalscorer at this level, and you can be sure there will be plenty of interest in the Argentina international. The question is, if United do sign Mauro Icardi where does that leave both Marcus Rashford and Romelu Lukaku? Keeping all three happy along with Anthony Martial will be some task. If Lukaku hadn’t hit top scoring form recently there would be calls for him to make way.